Bourbeau, Philippe and Caitlin Ryan, “Resilience, Resistance, Infrapolitics and Enmeshment”, in Endress, Martin and Benjamin Rampp (eds.) 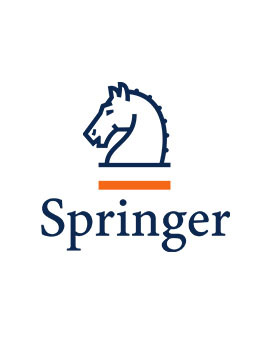 Resilience in Social, Cultural, and Political Spheres, New York, Springer. This is a reprint of our article published in the European Journal of International Relations. A great deal has been written in the International Relations literature about the role of resilience in our social world. One of the central debates in the scholarship concerns the relationship between resilience and resistance, which several scholars consider to be one of mutual exclusivity. For many theorists, an individual or a society can either be resilient or resistant, but not both. In this article, we argue that this understanding of the resilience–resistance connection suffers from three interrelated problems: it treats resilience and resistance as binary concepts rather than processes; it presents a simplistic conception of resilient subjects as apolitical subjects; and it eschews the “transformability” aspect of resilience. In a bid to resolve these issues, the article advocates for the usefulness of a relational approach to the processes of resilience and resistance and suggest an approach that understands resilience and resistance as engaged in mutual assistance rather than mutual exclusion. The case of the Palestinian national liberation movement illustrates our set of arguments. Bourbeau, Philippe, “Migration, Resilienz und Sicherheit“, in medico international (ed. ), Fit für die Katastrophe. 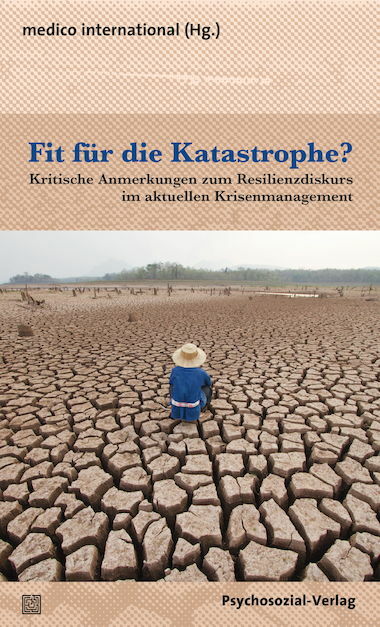 Kritische Anmerkungen zum Resilienzdiskurs im aktuellen Krisenmanagement, Giessen, Psychosozial-Verlag, 2017. This is a translation in German of my article published in the Journal of Ethnic and Migration Studies, 2015, 41(12): 1958-77. The ubiquity of resilience – the process of patterned adjustments adopted by a society or an individual in the face of endogenous or exogenous shocks – across the broad social sciences spectrum is undisputable. Yet, migration scholars have been relatively absent from this vibrant discussion. The present article suggests a theorization of the link between migration, resilience, and security by examining ways in which resilience precedes a socially constructed understanding of international migration as a security issue. The article explores how the surge in worldwide refugee numbers and associated mass migration phenomena were not only interpreted as a shock in post-Cold War France, but also instrumentalised by dominant discourses to underscore the necessity of adopting a particular pattern of adjustments to uphold the status quo against changes provoked by these migratory events. The social construction of refugee movements and mass migration as a significant disturbance requiring France to opt for a resilient strategy has led, ultimately, to the securitization of migration. In a broader sense, the article presents a new lens through which to analyze situations and conditions in which resilience has led to and induced the securitization of migration. 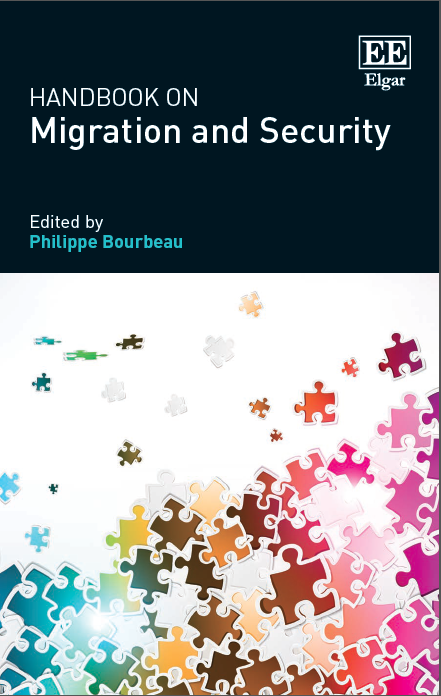 Bourbeau, Philippe, “Migration and Security: Key debates and research agenda“, in Bourbeau, Philippe (ed. ), Handbook on Migration and Security, Cheltenham, Edward Elgar, 2017, 1-11. The Handbook on Migration and Security seeks to provide analyses of several aspects of the links between migration and security in a globalized world. This unique Handbook has two objectives: first, to explore the growing diversity of approaches, paradigms, questions, and methods developed to study the migration-securety nexus; second, to initiate a multidisciplinary dialogue about the ontological, epistemological, explanatory, and normative aspects of the links between migration and security in social sciences and beyond. Drawing content from a wide range of international scholars, the volume examines the securitization of migration across several disciplines and issue areas. Bourbeau, Philippe, “Migration, Exceptionalist Security Discourses, and Practices“, in Bourbeau, Philippe (ed. ), Handbook on Migration and Security, Cheltenham, Edward Elgar, 2017, 105-24. I put forward three main arguments in this chapter. First, I contend that each of the logic of exception and the logic of routine, on its own, presents an incomplete picture of the securitisation process; thus, each theoretical camp fails to present a convincing framework for the study of securitisation. The incompleteness of these logics manifests itself on multiple fronts, including their understanding of change and recurrence, their visualization of the securitisation process, and their identification of securitising agents. Second, I argue that the two logics share two important commonalities: security performance and path dependence. The securitisation process is first and foremost about a performance – a process of doing something – and refers to decisions that are socio-historically informed. Finally, I contend that moving forward together will help scholars to study the coexistence of development and change, critical junctures and recurrence, and transformation and reproduction. Bourbeau, Philippe, “Resilience, Security and World Politics“, in Chandler, David and Jon Coaffee, (eds. 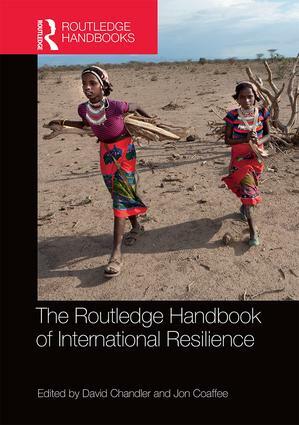 ), Routledge Handbook of International Resilience, London, Routledge, 2016, 26-37. In recent years, a great deal has been written in the scholarly literature about the role of resilience in our social world. This scholarship has sparked vivid theoretical debates in psychology, criminology, social work, and political geography about the nature of resilience and how scholars should go about studying it. 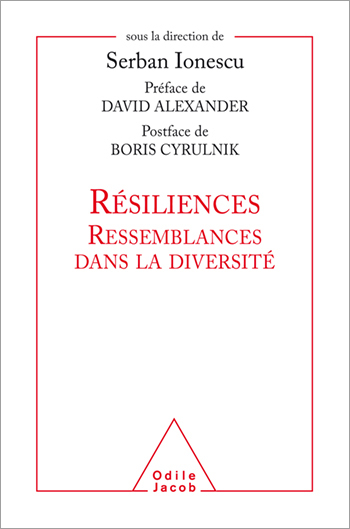 Resilience is increasingly making its entries into International Relations (IR) literature. This chapter provides a brief introduction to how the concept of resilience has been defined and deployed within social sciences, suggests a particular definition of resilience, and outlines a terrain of debate and research agendas. Bourbeau, Philippe, “La résilience en relations internationales: le côté clair et le côté obscur“, in Ionescu, Serban (sld. ), Résiliences. Ressemblances dans la diversité, Paris, Odile Jacob, 2016, 283-97. L’objectif de ce chapitre est de proposer une théorisation novatrice de la résilience dans le champ des relations internationales. Ce chapitre est divisé en trois parties. En premier lieu, nous passerons en revue les différentes applications de la résilience en relations internationales afin de mettre en lumière le sous-développement de ce concept et la nécessité de pousser plus loin une analyse de la résilience en relations internationales. Nous proposerons par la suite un cadre d’analyse en trois points de la résilience. La dernière section de ce chapitre offrira une typologie de la résilience en distinguant la résilience afin de maintenir le statu quo, la résilience en tant que modifications marginales et la résilience entendue comme renouvèlement. Bourbeau, Philippe, “A Multidisciplinary Approach to Security“, in Bourbeau, Philippe (ed. 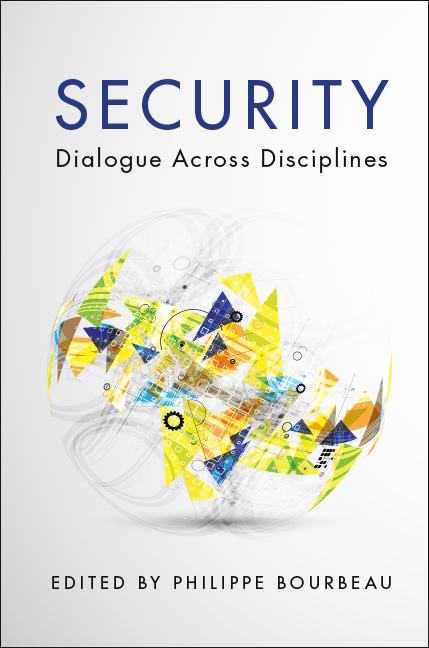 ), Security: Dialogue across Disciplines, Cambridge, Cambridge University Press, 2015, 1-21. In this chapter, I introduce five unifying conceptual elements and areas of common ground that a multidisciplinary approach to security provides. I then present contributions of each chapter, focusing on the substantive research and analytical tools that each discipline offers, while intertwining and situating these contributions within a multidisciplinary study of security. Acknowledging that each discipline has its preferred way of framing a research question, of searching for hypotheses, and of conducting research, the contributors were asked to discuss and assess the following four points: (1) What are the fundamental questions orienting the research on security in your discipline? ; (2) Are there dominant theories of security in your discipline? Which perspectives are considered marginal? ; (3) How is the concept of security studied in your discipline? Is there a dominant research method? ; and (4) What are the biggest strengths and limits of your discipline in the way security is studied and theorised? Would a more interdisciplinary approach to the concept of security help in reducing the identified limits of your discipline? Bourbeau, Philippe, Thierry Balzacq and Myriam Dunn Cavelty, “International Relations: Celebrating eclectic dynamism“, in Bourbeau, Philippe, (ed. ), Security: Dialogue across Disciplines, Cambridge, Cambridge University Press, 2015, 111-36. In the past decades, debates in security studies have evolved through several interrelated turns. Security has indeed been structured, systemised, broadened, deepened, gendered, humanised, constructed, and privatised. Theoretical and empirical studies detailing the contours and important of each of these turns as well as the persistence of key concepts abound in specialised journals and beyond. Celebrating and detailing this eclectic dynamism, this chapter provides an overview of the research questions, theoretical perspectives and research methods that are driving the field by analysing three preconceptions that persist. First, that security’s typical referent object is still national security (or state security). Second, that North American scholars (and particularly US ones) produce mainstream security studies while European scholars are the guard keepers of critical security studies. Third, that critical approaches to security are incompatible with methods generally associated with positivist epistemology, whereas orthodox or traditional approaches to security cannot work with anything else than a positivist epistemology. To be sure, a one-chapter survey of the literature of this enormous field of inquiry cannot deign to be comprehensive. However, it is meant to provide a reasonable sense of prominent schools of thought, authors, debates, concepts, questions, and answers. Bourbeau, Philippe, “Resiliencism and Security Studies: Initiating a dialogue“, in Balzacq, Thierry (ed. 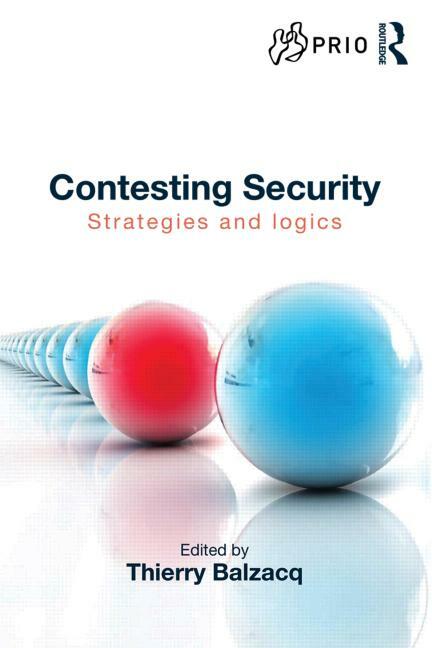 ), Contesting Security: Strategies and Logics, London, Routledge, 2015, 173-88. Contesting Security investigates to what extent the ‘logic of security’, which underpins securitization, can be contained, rolled back or dismantled. Featuring legitimacy as a cement of security practices, this volume presents a detailed account of the “logic” which sustains security in order to develop a novel approach to the relation between security and the policies in which it is engraved. Understanding security as a normative practice, the contributors suggest a nuanced, and richer take on the conditions under which it is possible, advisable or fair to accept or roll back its policies. The book comprises four sections, each investigating one specific modality of contesting security practices: resistance, desecuritization, emancipation, and resilience. These strategies are examined, compared and assessed in different political and cultural habitats. Bourbeau, Philippe, “Securitisation“, in Wright, John D., (ed. 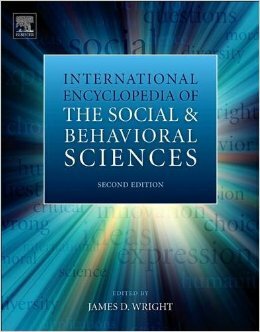 ), International Encyclopaedia of Social and Behavioural Sciences, 2nd edition, Oxford, Elsevier, 2015, 395-99. Securitization is one of the most dynamic fields of research in today’s security studies. This article (1) examines the various definitions developed by scholars to make sense of the phenomenon, (2) presents the two logics upon which most of the research is conducted (i.e., the logic of exception and the logic of routine), and (3) identifies avenues of research that will most likely drive future research in this field.